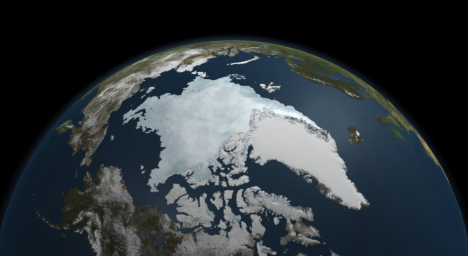 There’s probably no stopping the decline of Arctic sea ice. FRISCO — Averaged across the Arctic, the melt season is lengthening by five days each decade, with much of the change coming in the fall, when a warmer ocean simply takes longer to freeze than in the past. “The extent of sea ice in the Arctic has been declining for the last four decades,” said University College London researcher Julienne Stroeve, part of a research team that studied satellite data to track sea ice trends in the age of global warming. The data confirm that the Arctic Ocean absorbing ever more of the sun’s energy in summer, leading to an ever later appearance of sea ice in the autumn. In some regions, autumn freeze-up is occurring up to 11 days per decade later than it used to. This entry was tagged Climate Change, Ice melt, Sea Level. Bookmark the permalink.